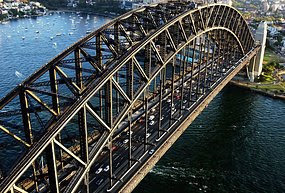 One interesting announcement in yesterday's NSW state mini-budget was the introduction of "congestion tolls" on the Sydney Harbour Bridge and Tunnel: the toll will vary depending on the time of day. Tolls will increase from $3 to $4 during peak travel times, stay the same during a shoulder period and drop to $2.50 at night. Time of day tolls can be a sensible measure to reduce congestion: they encourage motorists to avoid driving at peak hour. The demand for road space varies throughout the day so a price that also varies to reflect that changing demand is likely to improve efficiency. Commuters accept variable time-of-day charges for rail in Sydney, so why not roads? The government should closely monitor traffic densities and speeds at different times of day now and after the toll comes in to see what impact the toll has. Time of day tolling should also be applied to other Sydney toll roads such as the M4 and M5 (the government has flagged this) - at least if the Sydney Harbour tolls are effective in reducing in congestion. The public is cynical about this change and sees it as a revenue grab (which it probably is). If the government genuinely sees this as a congestion measure and wants it to be embraced, they should consider making it revenue-neutral or, more simply, reducing the night toll by the same amount as the peak toll increases. Alternatively, the additional revenue could be clearly earmarked for additional peak hour public transport so that people have a decent alternative to just paying the toll and continuing to drive. What do you think of the tolls?